Halloween season is one of the most festive times of year at Walt Disney World. It is interesting to see the Magic Kingdom decorations up more than two months in advance of the actual holiday. I took this shot near the entrance last night. The first "Mickey's Not So Scary Halloween Party" is tomorrow night and I'm sure it is going to be a good time for those attending. I'm looking forward to going to the party in October, a little closer to Halloween. The Dole Whip pineapple soft serve is one of the most unique and popular treats you can get at Walt Disney World. It is only available in Adventureland and at the Polynesian Resort. It used to be inside Captain Cook's at the Polynesian, but when that restaurant reopened recently, the Dole Whip was missing. However, just last night, the Pineapple Lanai opened, and the famous ice cream is once again being served at this resort. 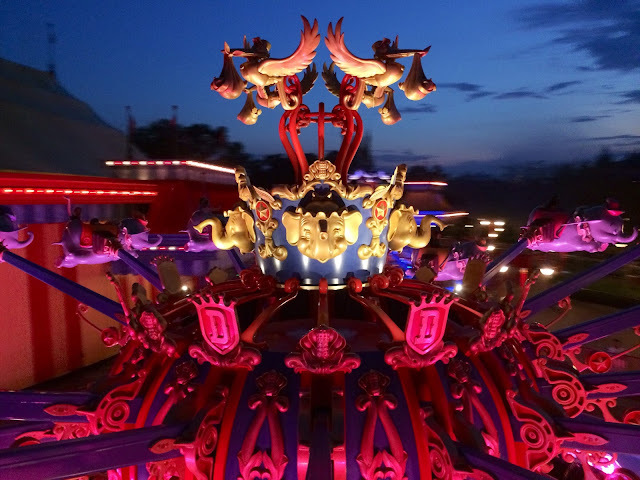 There are many attractions at Walt Disney World that have pre-shows, which help to set up the ride that you are about to experience. 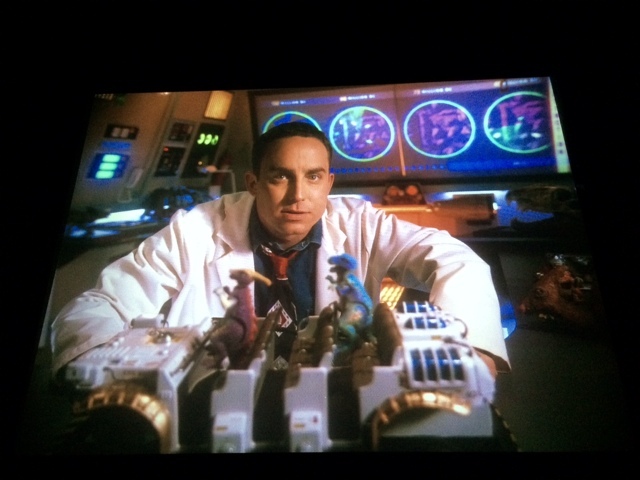 One of my favorites is the short video that plays in advance of Dinosaur at Animal Kingdom. I rarely get a good photo of a video, but I managed to get a decent one of Dr. Seeker before I traveled back in time with my son yesterday. 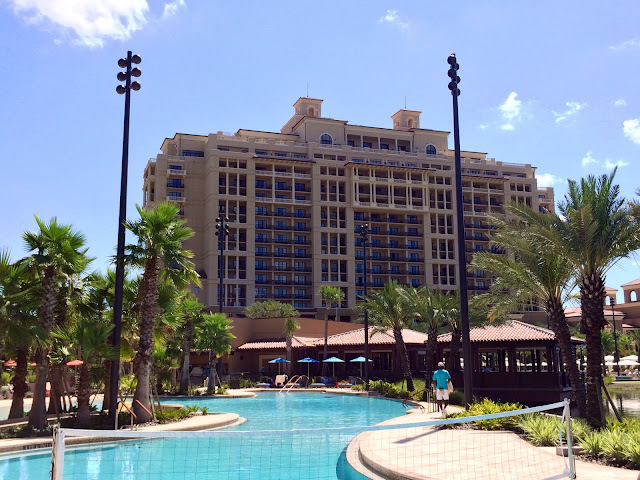 The Four Seasons Resort opened earlier this month in the Golden Oak Community at Walt Disney World. I had the chance to tour this luxury five-star hotel today, and was very impressed. The lobby is beautiful and the views are amazing, but the most impressive part of the resort is the sprawling outdoor water recreation area. I took this shot from one of two infinity pools. Although this isn't a Disney owned hotel, I don't think it will be long before it is the most desired spot on property. 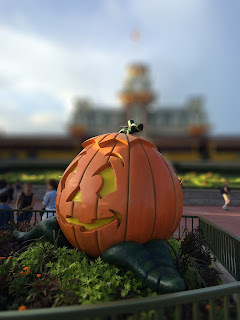 This week marks the 3 year anniversary of Digital Disney World's "Picture of the Day" segment. 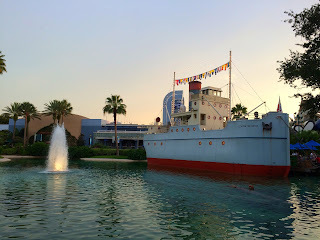 Nearly everyday since August 26th, 2011, I have been posting a picture that I've taken at Walt Disney World. I want to thank you all for continuing to enjoy this website. I get so many great comments and feedback and I certainly appreciate the support. I am always looking for new and interesting photo opportunities when I'm in "The World," and I hope to keep posting pictures for years to come. With this three year milestone, I have decided to add a new segment to Digital Disney World. I recently had the opportunity to make digital copies of several hundred pictures from Disney trips that I took with my family as a child. They are from 5 different vacations from 1977 to 1988. Most of these photos were taken by my parents, and I thought it would be fun to post one every week as part of a new "Way Back Wednesday" (WBW) segment. As I was flipping through the pictures, I noticed many interesting shots that included extinct attractions and shows. Also, Magic Kingdom and Epcot had a much different "look" back then. I decided to go with a classic Magic Kingdom shot for the first Way Back Wednesday installment. This is from my very first visit to Walt Disney World in 1977. You can see the 5 year old version of me standing with Pluto in Fantasyland. The queue to 20,000 Leagues Under the Sea is to the left and you can see a pole and wires from the Skyway to Tomorrowland over Pluto's head. Oh, and no comments about my cool 1970's man-purse I was wearing......it was a satchel! Typically, there isn't anything unusual or unique about a boat dock at Walt Disney World. However, you can see that an important part of this one at the Magic Kingdom is missing. While waiting for the boat to Fort Wilderness last week, we realized that we were baking in the hot sun. 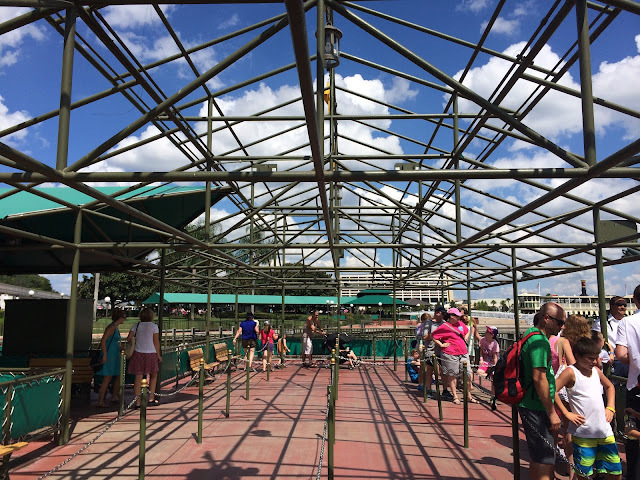 They are apparently in the process of replacing the canvas roof of the structure. Until it is complete, this is quite a warm spot to wait for a boat! A few nights ago, I rode Dumbo with our son. However, for the first time, he was flying solo in his own elephant. I shot this photo while near the top of the ride. A few seconds later, this proud photography blogger turned around to see his 7 year old son taking a similar picture from his Dumbo! The apple doesn't fall too far from the tree. 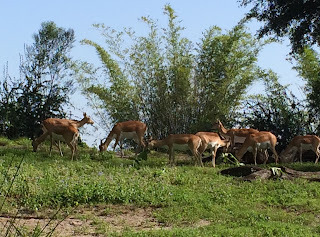 While walking through the Maharajah Jungle Trek a few days ago, I noticed this herd of blackbucks grazing on a hillside. I've seen these animals many times, but didn't know much about them. So, as I always like to learn something new while in a Disney park, I decided to talk to the nearby cast member. It turns out that blackbucks are among the fastest land animals in the world, and can reach speeds of close to 50 mph! 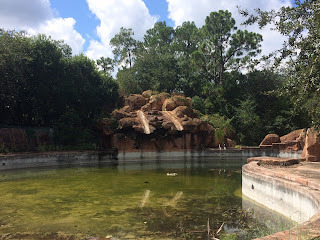 This is another reason why I love Animal Kingdom......there is so much to discover on every visit. 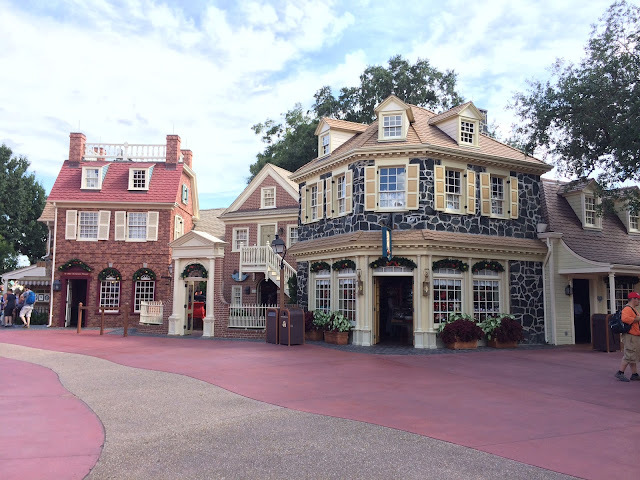 Captain Cook's at the Polynesian had been closed for an extensive refurbishment for several months. It recently reopened and I had the chance to visit for some quick pictures tonight. Although the basic floorplan is the same, it seems to have been completely redone. The one major change was the replacement of the Dole Whip machines with "grab and go" coolers. It appears that Disney is preparing for the DVC guests who will be staying at the Polynesian in the future. 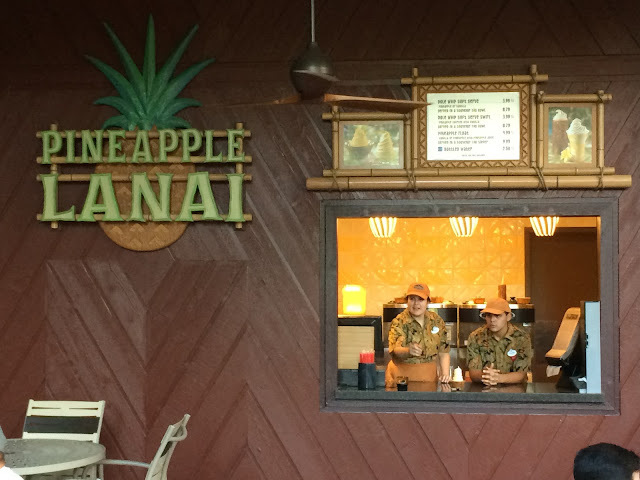 However, there will be new Dole Whip kiosks installed not far from Captain Cook's. It is widely known that Walt Disney was a huge fan of trains, and our son seems to be following in his footsteps. Whether it's Thomas the Train, a diesel freight train, or an Amtrak passenger train, he can't seem to get enough of them. 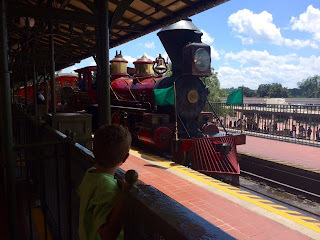 His favorites, however, have always been the old fashioned steam engines, and there is no better place to see them up close than the Magic Kingdom. He hopes to someday be an engineer on the Walt Disney World Railroad, and he loves to spend time riding whenever he gets the chance. I took this shot of him marveling at the Walter E. Disney, as it pulled into Main Street Station last weekend. 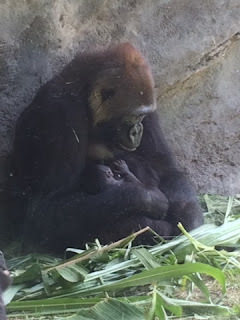 This morning, I was walking through the Pangani Forest Trail at Animal Kingdom and was fortunate to see this adorable baby gorilla in his mother's arms. He was born just two weeks ago and apparently still hasn't been named. His mother is Azizi, who was nursing him in this photo, and his father is Gino. These animals are critically endangered western lowland gorillas, and Animal Kingdom plays a vital role in the survival of this species. When attractions go down for refurbishment, they are simply unavailable for guests to enjoy until the project is done. 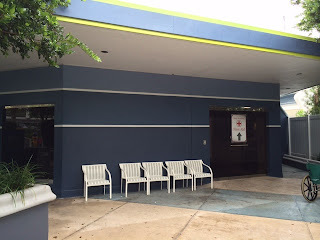 However, when it is time for a refurbishment to the the Magic Kingdom first aid station, there must be an alternative for those who may need medical assistance. This was the case for the last ten days, and the temporary first aid station was located in an interesting spot. 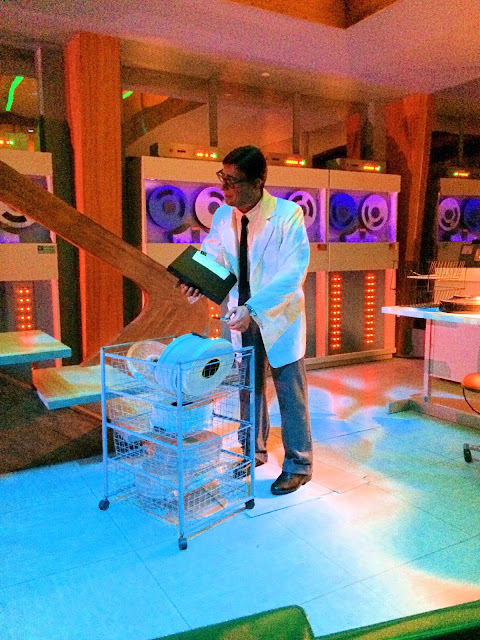 For some guests, a trip on Space Mountain may be followed by a visit to first aid. Well, from August 10th to the 19th, the first aid station was actually located inside the Space Mountain building! 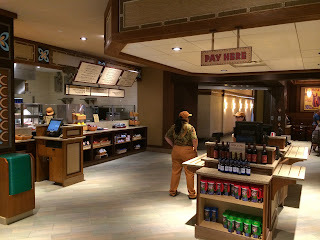 Disney used the old Fed Ex VIP lounge, which is normally not accessible to guests, for this purpose. The Liberty Bell at the Magic Kingdom is an exact replica of the original. In fact, it is the only other bell cast from the same mold as the original. It was placed in Liberty Square in 1987 for the bicentennial of the Constitution. 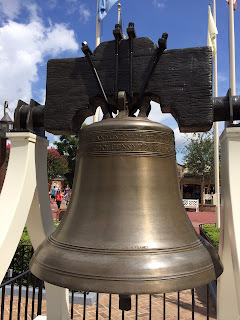 Just like the original, the word Pensylvania is misspelled on Disney's Liberty Bell. I took this shot over the weekend while giving a Magic Kingdom tour. Long before Typhoon Lagoon and Blizzard Beach came along, there was only one water park at Walt Disney World. River Country was located at Fort Wilderness from 1976 to 2001. Even though this park has been closed for nearly 13 years, it is still there. 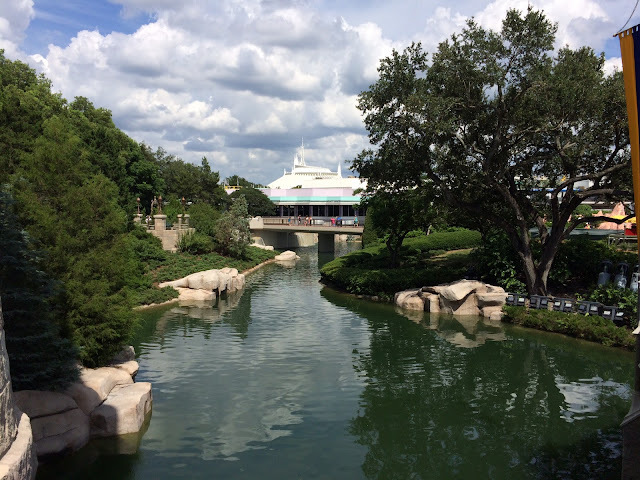 Although it is surrounded by tall fences that mostly block it from the view of guests, it can still be seen from certain areas, including from out on Bay Lake. I snapped this shot of a few dilapidated slides, known as Slippery Slide Falls, yesterday through a small open area in the fence. The "pool" where the slides emptied into was called Upstream Plunge. I have never heard an explanation as to why Disney simply abandoned River Country as opposed to demolishing it. I'm sure they have their reasons. This morning, we had breakfast at Trails End Restaurant at Fort Wilderness. We then took a boat over to the Magic Kingdom so my son and I could get haircuts. 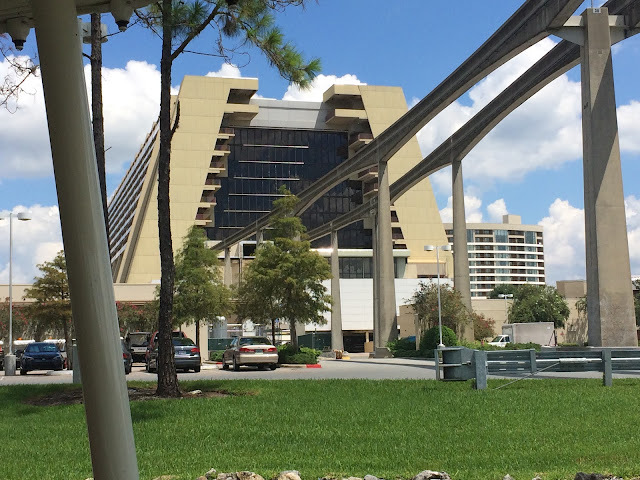 On the way, we passed by the Contemporary and I snapped this view from the water. 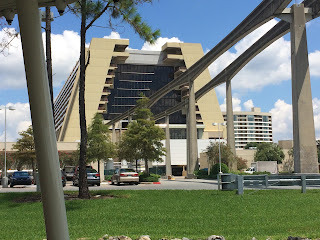 This certainly isn't a rare shot, but it is a somewhat unique perspective of this popular resort. 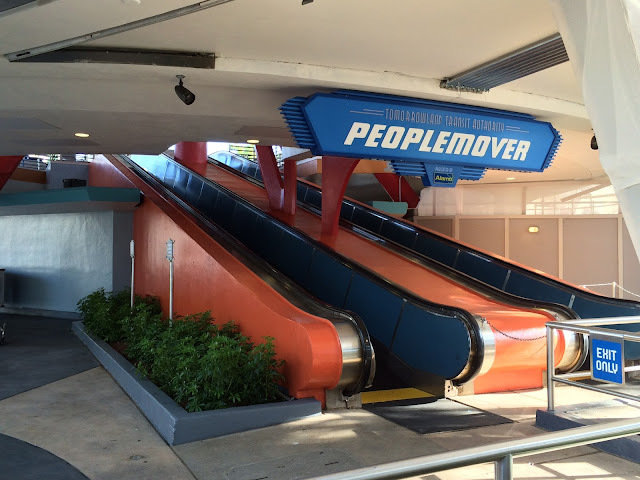 The PeopleMover just recently re-opened after a refurbishment. It is the same classic ride, however there is one notable change that quickly stuck out when the construction walls came down. The color scheme of the "station" has changed completely, with orange and red becoming the prominent colors. I took this shot today while giving a Magic Kingdom tour. Once in a while you can see characters riding attractions along with the guests. 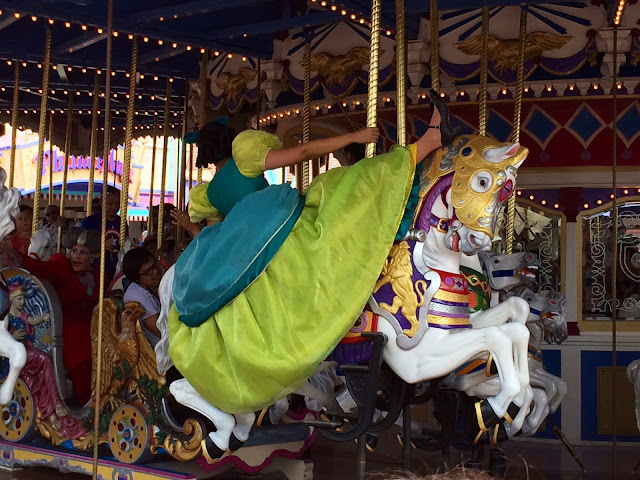 This was the case a few weeks ago when I spotted Lady Tremaine, Drizella, and Anastasia riding on Prince Charming's Regal Carrousel. It was fun to see them interacting with the guests and each other with the personalities that are right out of the 1950 film, Cinderella. 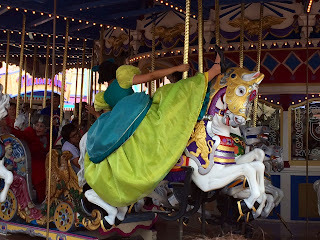 I got this shot of Drizella as she was riding her horse in a unique manner. 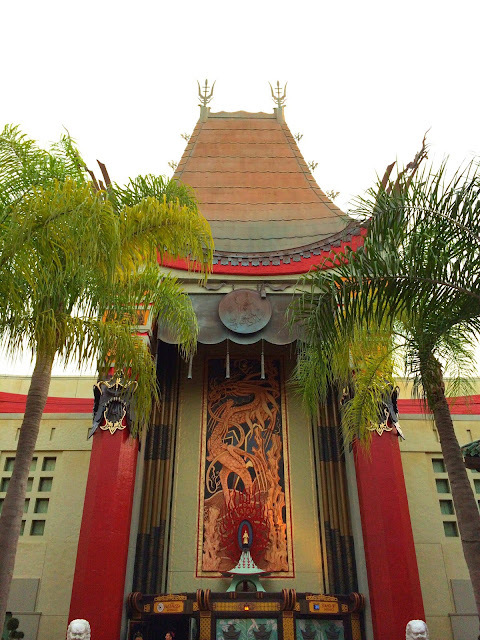 The Great Movie Ride is a Walt Disney World classic attraction. It has been entertaining guests at Hollywood Studios since opening day. It was originally going to be an attraction at Epcot, but when Disney decided to build an entire park focused on movies, it made sense that The Great Movie Ride would be part of what was originally called MGM Studios. The exterior of the building is a full scale replica of the Chinese Theater in Hollywood, which is where Mary Poppins debuted back in 1964. I took this shot while giving a guided tour of Hollywood Studios about two weeks ago. 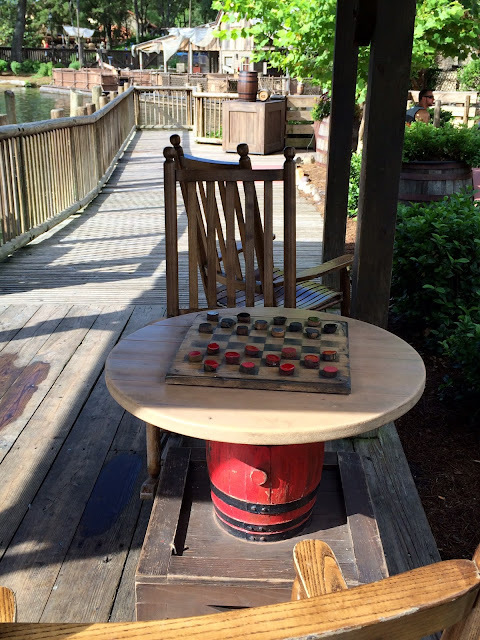 This quiet little spot in Frontierland is located on the river, not far from the exit to Big Thunder Mountain. 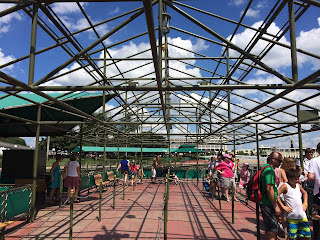 It is a nice, shaded area where guests can wait for friends or family who may be riding the coaster. There are several rocking chairs, as well as a checker board to pass the time. This is a designated smoking area, but often times there aren't any smokers nearby. 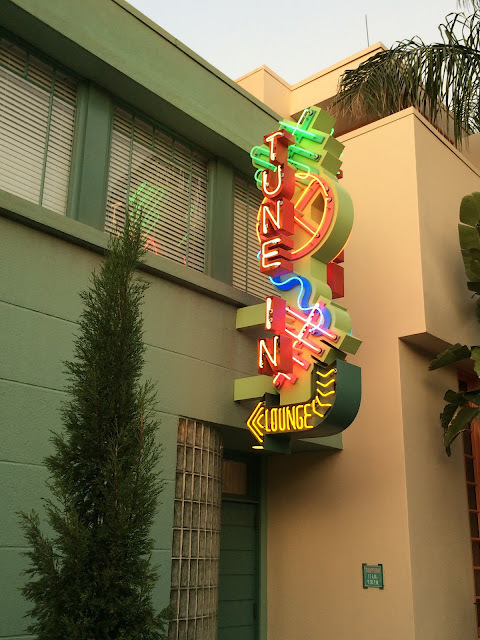 The Tune In Lounge is a full service bar connected to the 50s Prime Time Cafe at Hollywood Studios. 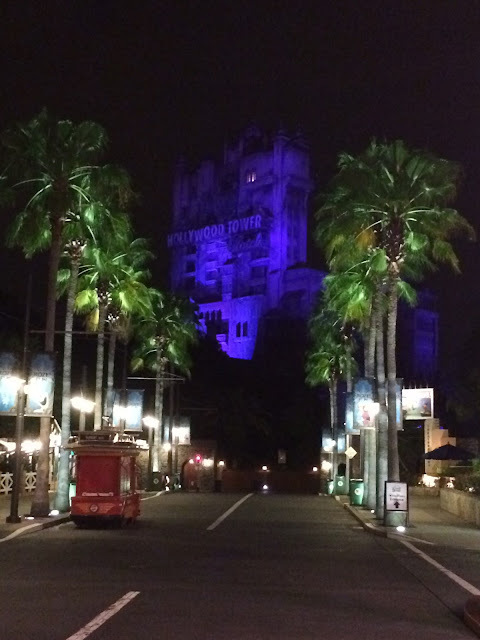 Because of its lack of windows and non-descript sign, most guests don't even know it exists. It is a great spot to take a break from the hot Florida sun, or to just grab a quick drink while waiting to be seated in the adjacent restaurant. The Fountain of Nations at Epcot is much more than a simple water fountain. First off, it has an interesting beginning which dates back to its dedication in October of 1982. On that day, there was a container of water from 29 different nations poured into it by representatives from those nations. More than 30,000 gallons of water cascade over its tiered sides every minute. 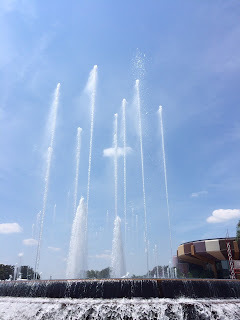 There are 200 pneumatic shooters that create dancing waters synced with musical selections to entertain guests who are walking by. Some of this water is launched over 80 feet into the air, which can be seen in this photo I shot a few weeks ago. Ye Olde Christmas Shoppe is a fun place to purchase Christmas related merchandise all year long. They have everything from stockings to personalized ornaments. Located in Liberty Square, it is rare to get a shot like this, without guests in the frame. There is a fun little detail near the shop's entrance closest to the Liberty Tree. You will see a small sign with the word "Kepple" on it. This is a tribute to Walt Disney's paternal grandfather, Kepple Disney. I took this shot from just outside of the entrance to Cinderella Castle. This is the view looking east toward Tomorrowland. You can see the moat in the foreground and Space Mountain in the distance. They are in the process of filling in a large portion of the moat to make more room for guest traffic during the busiest parts of the day. However, the water seen in this photo should remain forever. Last week, I took my tour guests to Fantasmic at Hollywood Studios, and I left the theater just before the show started. As I walked down Sunset Boulevard I realized that there was nobody else around. The park closes 30 minutes prior to the final Fantasmic, and most of the guests who weren't watching the show had already left the park. This was a great opportunity to take a bunch of fun pictures, and here is the first one I snapped. I took this picture of Echo Lake around sunset a few nights ago. This area, near the center of Hollywood Studios, is home to several duck families, as well as the S.S. Down the Hatch. There are some tables and chairs set up along the edge of this body of water, where I enjoy waiting for my tour guests when they are having lunch at one of the nearby restaurants. Spaceship Earth has always been one of my favorite attractions at Walt Disney World. It combines the history of communications with a chance to see what your future may look like. This shot of the 70s mainframe scene shows a "tape librarian" who worked with these giant reel-to-reel computers from 40 years ago. 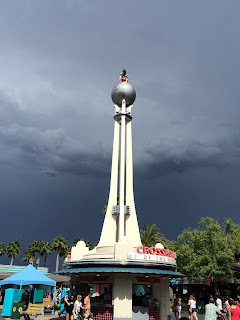 This replica of the Crossroads of the World tower is right inside of the entrance to Hollywood Studios. The original tower can be seen in Los Angeles, in an area that was considered to be America's first shopping mall. The major difference with the Walt Disney World version is that Mickey Mouse is standing on top of it. It is interesting to note that one of Mickey's ears is actually a lightening rod. From this picture, you can see that there was certainly lightening in the area yesterday, but thankfully Mickey wasn't struck. I have been enjoying the Indiana Jones Epic Stunt Spectacular for 24 years and finally had the chance to participate in the show tonight. 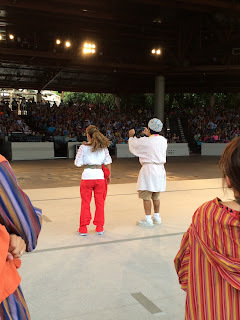 I was giving a tour of Hollywood Studios and sitting in the front row with my guests when I was picked to be an extra. During the scene when the "plant" was getting beat up by Marion's stunt double, I couldn't resist snapping this quick shot. I thought it would be fun to show what it looks like from this perspective. Pecos Bill Tall Tale Inn and Cafe is the big, quick service restaurant in Frontierland. It is one of my favorite eateries in the Magic Kingdom. This morning, I was giving a tour and found myself in this area of the park before it got crowded. It is rare to get a clear shot of this spot without guests in the picture. As I was waiting for my tour guests at the Canada pavilion at Epcot today, I noticed a detail that I hadn't seen before. 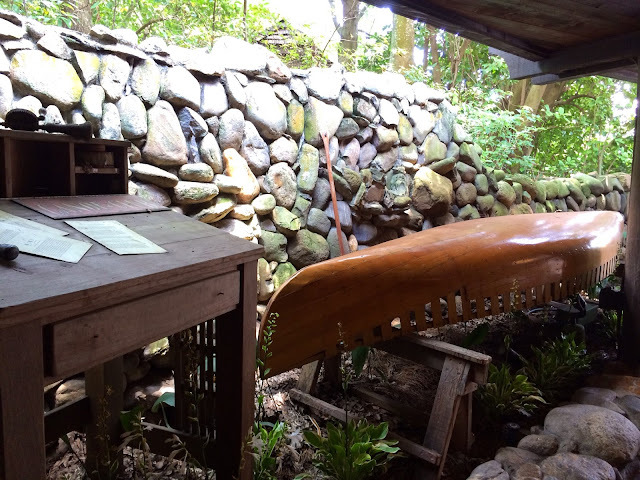 Near the exit to O Canada!, there is a desk sitting next to a canoe. On the desk is a small sign that reads "Canadian Rivers Canoe Club." This is just another example of how Disney incorporates a story into just about everything they do.